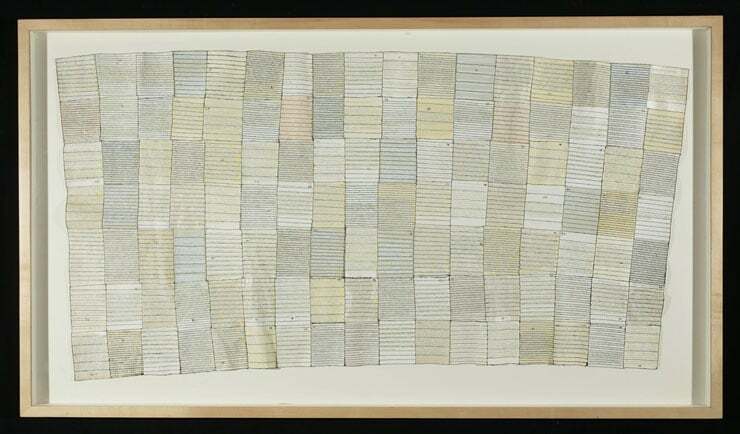 What Was Beautiful, 1-119 (total projected: 365), stitching and collage on paper, 74 in x 36 in, 1999-ongoing. Detail from What Was Beautiful, stitching and collage on paper, 1999-ongoing. What Was Beautiful 1-119 (total projected: 365), stitching and collage on paper, 74 in x 36 in, 1999-ongoing. In its entirety, What Was Beautiful, will be composed of 365 squares of paper in varying hues of white and cream. Each square measures four by five inches and is embroidered with tiny black and deep blue lines. Each square presents a written description of what appeared to be of beauty on any given day. The work is extremely slow to make, but its subject is about time’s slow passage and the significance or insignificance of each passing moment. Though I wish I could produce more of this stitched work more quickly, I have accepted the organic pace that this kind of work requires. Today, the sun shone in swathes that sequined like silver swells on an earthen sea. The air was redolent of smoke and soil. Blue sky, brown field; silver light and far away a farmer in blue jeans and a turquoise top walking next to a turquoise tractor. Today his cooked air wafted into and out of his resting lips. His smell is too precious to contain in language. The weight and warmth of his arms are my most specific security. When he says that he could just walk away, it is true. Feeling nothing and feeling deeply can co-exist, it seems, on separate floors of the night-brightened self. I understand. His sleep -sealed eyes and air-open lips were what beauty was today. Though I was trained as a painter, the use of stitching in my work is taking on increasing relevance and importance. Since 1994, I have used stitching because the actual act of pushing a needle through thick paper requires both time and persistence. The activity itself became a metaphor for endurance and self-expression. 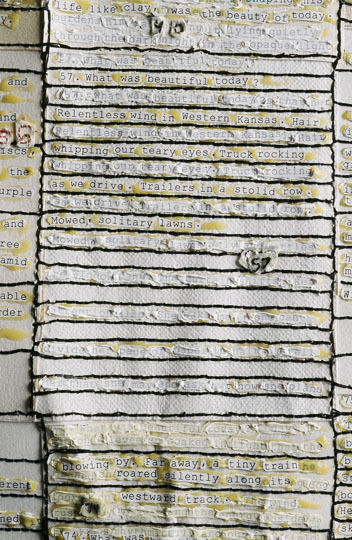 Originally, I was using stitching as an embellishment or as a stand-in for language, but slowly the stitching, in combination with language, has come to represent time, and the tendency of time to act as a structure that contains narrative and memory.